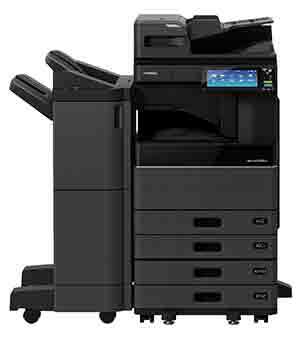 Midshire can supply and maintain the full range e-STUDIO photocopiers, from well known manufacturer Toshiba. The e-STUDIO range of photocopiers can combine printing, scanning, photocopying and fax into one device, helping to maximise productivity. These full colour devices range in page speed from 20 page per minute for small work groups, right up to 75 pages per minute for busy offices that have a high print demand. Toshiba are innovators in pioneering technology with an extensive portfolio of multifunctional printers and many other devices. We can now supply computing devices and display solutions straight to you. We stock a range of Toshiba products, with the most impressive being the e-STUDIO that provides high performance functionality with a variety of options to fit every business. Here we take a look at the different models and why they are suited to your office. Toshiba is committed to the environment and has devised a scheme, with the help of carbon-offsetting experts, called Toshiba Carbon Zero. This scheme means they can offset the carbon footprint of your Toshiba photocopiers and a set number of pages. The Toshiba CarbonZero program ensures Toshiba and customers are working together to support projects around the world, to help prevent further damage to the environment.